Our first multi-city minor league baseball adventure took us to one of our least favorite destinations - Connecticut. Not sure why, but it's just not a place we like to travel to (nor is most of the rest of New England, at least the parts we've been to). I had a 'full' weekend off, and since the Binghamton Mets were in New Britain we thought we'd make a weekend jaunt of it (since there wouldn't be anything to do at home probably). The weekend actually started out on Saturday morning in Syracuse. Jill had a speaking engagement at the Sheraton Syracuse University for the AAPC. Mike and I did a tour of Rite Aid's in the Syracuse area looking for items for Jill. After she was done, we started east along the thruway, stopping at the P.F. Changs in Albany for lunch (yummy!). We had originally planned on just going to Mohegan Sun to check that out, but as we progressed further into Connecticut we realized that we would be able to make it to Norwich in time for the baseball game - bonus! We arrived just before game time, and sat in traffic for a good 10-15 minutes. Not well designed, one road in, one road out, never bodes well for this kind of traffic. The stadium itself was nice, well cared for, but nothing here really 'jumped' out at us that would make us go out of our way to come back. There were actually quite a few people at this game, which was kind of against the 'norm' for the Defenders. It was a warm Saturday night, and they were giving out Tim Lincecum bobbleheads, so I'm sure both of those factors fed into the abnormally large crowd. My family and I spent the night at the Hampton Inn in Rocky Hill, CT after taking in a baseball game in Norwich, CT, and the night before yet another game in New Britain. When we pulled into the parking lot, we noticed that there were about 100 motorcycles parked in the lot, and a few interesting characters hanging out front smoking cigarettes. But, I don't personally have anything against motorcyclists or smokers (although I choose to do neither myself), so I wasn't too concerned. We checked into the hotel, and were given a room on the second floor, actually right above the check in desk (so our window was directly facing the area outside where the folks were outside). Lobby was actually a bit 'trashed' - that should have been our first clue, since it was an average Hampton Inn (and they don't typically look that way). Small, older woman was working the front desk, but was very friendly and sent us on our way to our room quickly. Room was clean - looked like all other Hamptons do. Beds were comfy - Bathroom was in good shape and clean as well. Unfortunately all night long our friends were outside holding motorcycle drag races in the parking lot, and just generally partying it up being very, very loud. The fan in the room does not run continuously, so we weren't able to drown the sound out really in any way, so we just left the TV on so our young son didn't have to listen to their foul mouths. The woman at the front was unfortunately unable to do anything about it at all... But, this was obviously not the fault of the hotel. My only reason for mentioning it is that my first instinct was to find another hotel, upon seeing the lobby in the shape it was. Should have gone with that instinct! I'd go back - but if the parking lot was filled with motorcycles again, I'd definitely turn around and find another hotel elsewhere! 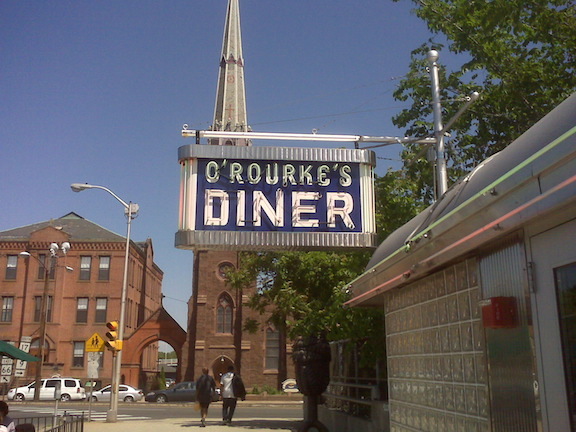 We happened to be in the New Britain, CT area for a ball game, and had previously seen a segment about the O'Rourke Diner on the Food Network. We gladly gave up our 'free breakfast' at the Hampton Inn to take the short drive to visit this establishment. Upon arriving, we noticed it to be a fairly 'rough' area (for Connecticut anyway), but on the corner sat this cute little diner, with a few tables out front. We were able to find street parking just a block or so away, and parked the car to walk up and find a short line. After waiting only about 10 minutes, we were seated inside. We were given our menus and a delicious little plate of breads - something to tide us over until the yumminess arrived! The menu is quite large, but I decided on the Irish Soda Bread French Toast (very delicious - three slices, each covered with a different type of jam. Their soda bread is much different than the Irish Soda Bread I make, but it was still very, very good). My son had the Napoleon Pancakes - three pancakes stacked "Napoleon style" with jam in between and whipped cream and a strawberry on top (also quite delicious - light and fluffy pancakes - jam was yumcious!). My husband had the Dubliner omelet, which was an omelet with Corned Beef hash inside, served with potatoes on the side (he reported the omelet was delicious. Potatoes were very good, although not 'common' hash browns by any means). Service was efficient - some servers were clearly friendlier than others, and several different people ended up helping us during our visit. I'd absolutely go back in a heartbeat, and would love the opportunity to head there for dinner, which is now being offered on Friday and Saturday nights. If you're in the area and looking for something a little 'different', stop by. It's not traditional greasy spoon diner fare - if that's what you're looking for, you might want to look elsewhere. But, the quality and quantity of food provided was excellent! After breakfast, it was off to New Britain Stadium to watch only the second 'away' game involving the Binghamton Mets. The Eastern League is more than a little spread out, so getting to away games (with so many other baseball options closer to home) is usually a chore. That being said, New Britain Stadium quickly became our second favorite Eastern League Stadium (second only to Binghamton Municipal Stadium of course). That may have a lot to do with the fact that the stadium looks very much like our own; not an exact carbon copy, but the design is very much the same! Seating area cut by the walkway, covered concession area under the stands, skyboxes on either side of the press box behind home plate (and down the lines) - it was a very eerie sight to see that's for sure! We had pretty good seats in almost the same 'spot' as we sit at home, and as an added bonus we sat in a row with the Binghamton Mets bus driver! He was there with his wife (who travels with him when she can) - very nice couple, very nice to be able to sit there and chat with them during the game. The B-Mets didn't fare so well in the game, but it was well worth the trip none the less between the stadium and folks around us. Wanting to grab some dinner before we started the trek home, so we scoped out the East Side Restaurant (from the ads at the stadium) - a German restaurant on, well, the east side of New Britain! Authentic German food (and beer) made for a yummy dinner for all of us! They had a man strolling around the restaurant, playing the accordion! We skipped dessert there though, because we had coupons for free Rita's from the baseball game! We found a Rita's on Queen Street in Southington to take advantage of those. Home to Binghamton afterwards. Put some fans in the seats, add in a mild Saturday night and playing at Dodd Stadium can be a lot of fun. The Connecticut Defenders didn't exactly have it easy, unlike Friday night's seven-run romp, but they still made it two straight over Boston's Double-A affiliate, Portland, with a 4-3 victory Saturday night. The win pushed Connecticut eight games over .500 (28-20) and within two wins of the break-even mark at home, where they sport a 10-12 record. It led to one of the louder post-game settings in the Defenders' locker room this season. "We're having some fun, winning is fun, and we've been playing good," Connecticut first baseman Brett Pill said. Pill was one of the major forces behind Saturday night's victory as he had a hit in his first three at-bats and drove in the first two Defender runs. Brock Bond had a lead-off single for the Defenders in the bottom of the first inning and went to second on an error. Two outs later, Pill delivered the clutch single to give Connecticut the early lead. It was Pill to the rescue again in the third inning with a runner on first and two out. Pill delivered, sending a ball deep to the gap in left-center for a double and the 2-0 lead. "Getting timely hits, scoring runs and not leaving anyone on base - the more RBIs you get, the better you can do," said Pill, who now has 30 RBIs this season and 16 doubles. "Brett led the league in doubles last year and he's been a doubles machine," Connecticut manager Steve Decker said. "He can go the other way into the right-field corner and pull them into the left-field corner." He can also hit them hard. In his fourth plate appearance of the night - after lucking out with an infield single in his third at-bat - he sent one deep to left-center before dying in a fly-out. "That was out of all the ballparks in the league except ours," Decker said. "If he hits that in the first five innings, it's out of the ballpark. But when that sun went down, the ball kind of went down, too." It wasn't all good for the Defenders, however, as they had to sweat out some tough situations, especially in the sixth, seventh and eighth innings. Portland (23-25) made it a one-run game in the sixth when designated hitter, Lars Anderson, doubled to left with two outs and was singled home by clean-up hitter, Aaron Bates. But Bates, who advanced to second on a throw home, was stranded when Connecticut reliever Ben Snyder got a fly-out from Jorge Jimenez. Connecticut answered with a run on another two-out base hit, this one by Jackson Williams, to give the Defenders the two-run advantage back. Snyder found himself in trouble again in the seventh when he walked lead-off batter Jon Still, and Ryan Kalish followed with a double to center. But the lefty picked up his 37th and 38th strikeout of the season in his 34th inning of pitching before inducing a pop-out to end the threat. "That was unbelievable," Decker said of Snyder's effort. Snyder allowed a run in the eighth on a sacrifice fly by Jimenez to make it a one-run game. But closer Joe Paterson breathed a deep sigh of relief when Ryan Kalish sent one hurtling down the right-field line to open the top of the ninth before landing foul. "Red Sox Nation" was well represented among the announced crowd of 5,035 who attended the game and supported Portland's effort. "I'm really happy with our fans, " Decker said. "I wouldn't come and watch a game in some of the weather that these fans have, and we appreciate that. But it's a little disheartening (when fans cheer on the opponents). I know it's 'Red Sox Nation,' I really do, and people are going to come watch (Boston's) future prospects. But I'm telling you what, we're about competing here and putting a good product (on the field)." NEW BRITAIN - A whole lot of people saw a whole lot of hitting. Most of the offense came over a three-inning period by the New Britain Rock Cats, and the 7,286 in attendance saw a little of everything. When all the beans were counted, the Rock Cats had enough to offset a shaky pitching performance. Whit Robbins had four hits and was one of three batters to drive in three runs Sunday as the Rock Cats drubbed the Binghamton Mets, 15-7, to get back on the winning side of .500. The Rock Cats (25-24) pounded out 19 hits, drew seven walks and had a player (Rene Tosoni) get hit twice by pitches. Seven players had multiple-hit games and seven drove in runs. Robbins had a double and three singles. Erik Lis had a double, two singles and three RBI. Brandon Roberts had three hits and scored twice. Matt Moses drove in three runs on two singles and a bases-loaded walk. With New Britain trailing 3-1, Roberts started the third inning with a solo homer. With the bases empty and two out, starter Jose Sanchez (1-6) yielded a single to Whit Robbins, wild pitched him to second and Lis singled in the run. After Tosoni was hit by a pitch, Matt Moses hit what looked like a routine grounder but it leaped over shortstop Ruben Tejada's head for an RBI single and a 4-3 New Britain lead. Binghamton tied it in the top of the fourth but the Rock Cats blew it open in the home half with six runs. A walk and successive singles by Brian Dinkelman, Danny Valencia and Robbins ended Sanchez's day. "[Sanchez] beat us on the last day in Binghamton [Monday]," Cats manager Tom Nieto said. "He changed speeds and I thought our guys made good adjustments. We hit some changeups, which is the pitch he gave us problems with over there. We had some good two-strike at-bats." Eric Brown came in and yielded an RBI double to Lis, hit Tosoni and walked Moses with the bases loaded. Yancarlos Ortiz capped the rally with a two-run double and the Cats led, 10-4. Doubles by Robbins and Tosoni highlighted a four-run fifth. The three-inning totals: 13 runs, 13 hits, five walks and two hit batters. It more than offset the seven earned runs and 11 hits permitted by Rock Cats pitching. Ryan Mullins battled through six innings in which he allowed five runs on seven hits and three walks. "The bottom line is that we're playing well," Nieto said. "Mullins started getting the ball down and gave us the six innings we needed, we swung the bats well and played good defense. We're happy to get a win." Mullins (3-6) wasn't fooling anybody early but earned a victory for his resilience. He was touched up for three runs in the first and solo markers in the fourth and sixth. He hit leadoff batter Emmanuel Garcia with a pitch, issued a one-out walk and yielded an RBI hit to Lucas Duda. Shawn Bowman sent a 2-0 pitch into the trees that line Willow Brook for a 3-0 lead. Mullins struggled through the second but was spared of further abuse by a relay that cut down a runner at third. He struck out former big-leaguer Nick Evans with the bases loaded to end it. Tosoni put New Britain on the board with his second homer in as many days and team-leading eighth of the season. CATS TALES: A controversial call at first in the fourth inning cost the Cats a run and a hitting coach. Floyd Rayford was ejected for dugout commentary after the play. It was later confirmed that the full garbage pail that made its way onto the grass in front of the dugout was Sugar Bear's last word. Brown was ejected after he walked Valencia in the fifth. With Dinkelman running on ball four, catcher Salvador Paniagua threw to second and into the runner, allowing him to take third. Brown left the mound, barked at home ump John Conrad and threw the ball away in disgust. When the Cats batted around in the fourth, Jeff Christy made all three outs. He started the inning with a groundout and popped into a DP to end it. We stayed at the Hampton Inn at 20 Waterchase Drive, Rocky Hill, CT, 06067; Room charge for the night was $89.72; we stayed in room 209. Our seats for the Rock Cats game were Section 113, Row E, Seats 6-7-8.